All the quotes in the following are from Martha Somerville (ed. ), Personal Recollections from Early Life to Old Age of Mary Somerville (John Murray, London, 1873) (denoted by [PR]), and from Rev James Wemyss, Burntisland in 1791, Statistical Account of Scotland Vol II, No XXXVIII, 423-433 (denoted by [SA]). 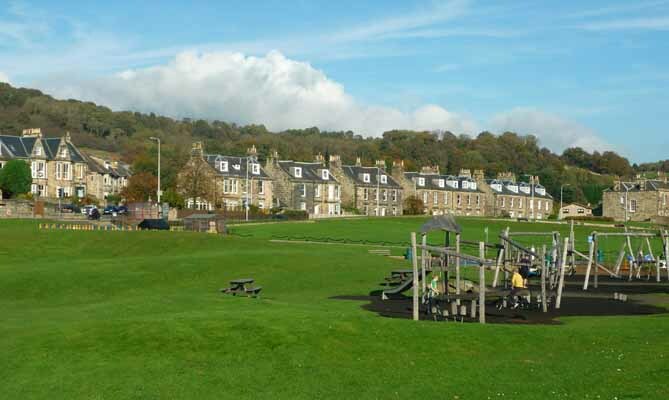 The town of Burntisland is pleasantly situated , upon a peninsula, surrounded by hills to the north, in the form of an amphitheatre. They lie at a distance of about half a mile, and happily occasion much warmth and shelter. The climate is very healthful. The air, dry and clear, rather sharp. Many of the inhabitants live to a good old age. They enjoy the benefit of fine dry walks of great extent, and can go abroad at all seasons, when it is fair. ... The number of souls in the parish may be about 1100. 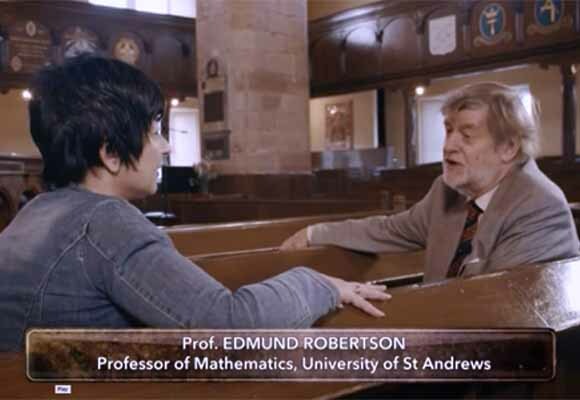 The purpose of my visit was to be filmed talking about Mary Somerville for the STV television programme "The People's History Show." I reached Burntisland from the east after first driving through Kinghorn. I was aware that Mary Somerville would walk from Burntisland to Kinghorn along the shore, and was struck by what a long walk this was. Before reaching the town of Burnisland, there is, on the left, the Links. This grassy area was one of the places where Mary used to walk but let us take a moment to think how the Links today compares with that of Mary's time. Burntisland was then a small quiet seaport town with little or no commerce, situated on the coast of Fife, immediately opposite to Edinburgh. It is sheltered at some distance on the north by a high and steep hill called the Bin. The harbour lies on the west, and the town ended on the east in a plain of short grass called the Links, on which the townspeople had the right of pasturing their cows and geese. The Links were bounded on each side by low hills covered with gorse and heather, and on the east by a beautiful bay with a sandy beach, which, beginning at a low rocky point, formed a bow and then stretched for several miles to the town of Kinghorn, the distant part skirting a range of high precipitous crags. As you can see there are now no cows or geese on the Links! In the above quote Mary speaks of the Links as bordering the sandy beach and indeed it does so, and today one can reach the beach from the Links via a tunnel under the railway line. This railway line is, by the way, the main East Coast line from London to Aberdeen and certainly was not there in Mary's day, being built in the middle of the 19th century. 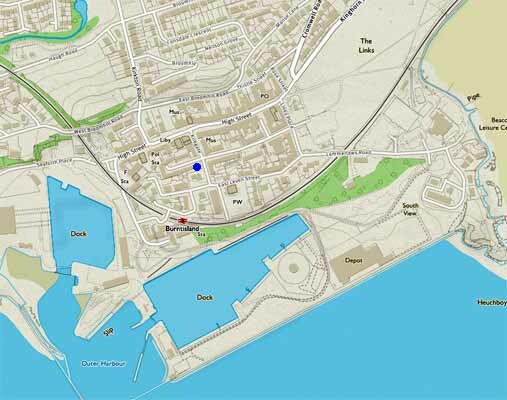 The building of the line changed the appearance of this area remarkably but the harbour that Mary describes has also moved. I was like a wild animal escaped out of a cage. When the tide was out I spent hours on the sands, looking at the starfish and sea-urchins, or watching the children digging for sand-eels, cockles, and the spouting razor-fish. I made a collection of shells, such as were cast ashore, some so small that they appeared like white specks in patches of black sand. There was a small pier on the sands for shipping limestone brought from the coal mines inland. I was astonished to see the surface of these blocks of stone covered with beautiful impressions of what seemed to be leaves; how they got there I could not imagine, but I picked up the broken bits, and even large pieces, and brought then to my repository. To the westward of the town towards Aberdour, the shore is all rocky; and, from a quarter of a mile eastwards, it is all sandy, till it joins the Pettycur harbour, near Kinghorn. ... It might be mentioned here, how beneficial the rocks and shores are to the inhabitants of this place, particularly the poor, from the large quantities of shell-fish that may be gathered, of one kind or another, at all seasons; especially cockles, which abound in the extensive lands between Burntisland and Kinghorn. A boy or girl may gather to the value of, perhaps, of 3d. or 4d. in a few hours. Excellent oysters are also to be had near the town. As a lonely child, she wandered by the seashore, and on the Links of Burntisland, collecting shells and flowers and spent the clear, cold nights at her window, watching the starlit heavens, whose mysteries she was destined one day to penetrate in all their profound and sublime laws, making clear to others that knowledge which she herself had acquired at the cost of so hard a struggle. Mary received widespread praise for her achievements. Her abilities were publicly recognised by the numerous honours that were bestowed upon her. This included the commissioning of many portraits. Only a few metres down Kirkgate, you reach a crossing with a dead-end called Somerville Square on the right and Somerville Street on the left. The house where Mary Somerville spent much of the first 24 years of her life still stands on the left hand side of Somerville Square. This street was originally called Quality Street. Our house, which lay to the south of the town, was very long, with a southern exposure, and its length was increased by a wall covered with fruit-trees, which concealed a courtyard, cow-house, and other offices. From this garden extended southwards, and ended in a plot of short grass covering a ledge of low black rocks washed by the sea. It was divided into three parts by narrow, almost unfrequented, lanes. Today the area south of the Somerville house is rather different. Houses have been built there but the main difference is the railway line and the railway station built in the middle of the 19th century. 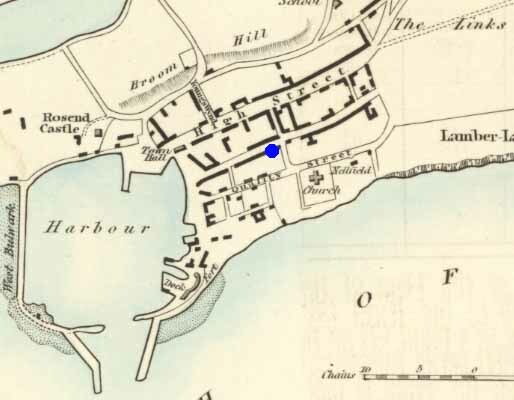 Also the harbour has moved and the rocks that Mary writes about, and where she went bathing, at the bottom of her garden have now completely gone due to the railway and the new harbour. The other houses on the same side of Somerville Square as the Somerville house are interesting. The one that is two away from the Somerville house has a plaque with the date of 1790, so was built while she lived in the street. It is an interesting house with two outside stairs. The other side of Somerville Square consists of modern houses of little interest (to me at least!). I never cared for dolls, and had no one to play with me. I amused myself in the garden, which was much frequented by birds. I knew most of them, their flight and their habits. The swallows were never prevented from building above our windows, and, when about to migrate, they used to assemble in hundreds on the roof of our house and prepared for their journey by short flights. I flattered myself that I had got precisely what I wanted; but I soon found that I was mistaken. I perceived, however, that astronomy did not consist in star-gazing, and as I persevered in studying the book for a time, I certainly got a dim view of several subjects which were useful to me afterwards. Unfortunately, not one of our acquaintances or relations knew anything of science or natural history; nor, had they done so, should I have had the courage to ask and of them a question, for I should have been laughed at. I was often very sad and forlorn; not a hand held out to help me. Standing in front of her house, one cannot help think of the sad and forlorn Mary. I had the silly thought, "If you were there today, Mary, I could teach you some mathematics!" Looking at John Robertson's The Elements of Navigation I was surprised to see how much mathematics there was in it. There are two volumes, each in several sections called "Books." The first Book contains 'Arithmetic', the second Book 'Geometry', the third Book 'Plane trigonometry', the fourth Book 'Spherics', the fifth Book 'Astronomy', and the sixth Book 'Geography'. The second volume is on sailing and fortifications. Now I got what I so long earnestly desired. ... demonstrate a few problems in the first book of 'Euclid', and then I continued the study alone with courage and assiduity, knowing I was on the right road. I had already gone through the first six books of Euclid, and now I was thrown on my memory, which I exercised by beginning at the first book, and demonstrating in my mind a certain number of problems every night, till I could nearly go through the whole. In fact her mother may have unwittingly done Mary a service for one would have to say that this ended up as an excellent way to fully understand geometry. I soon found that it was in vain to occupy my mind beyond a certain time. I grew tired and did more harm than good; so, if I met with a difficult point, for example, in algebra, instead of poring over it till I was bewildered, I left it, took my work or some amusing book, and resumed it when my mind was fresh. Poetry was my great resource on these occasions, but at a later period I read novels. 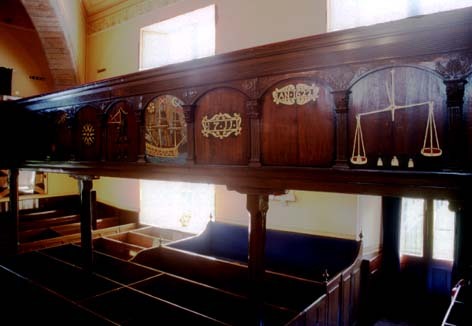 The kirk was very large and quaint; a stair led to a gallery on each side of the pulpit, which was intended for the tradespeople, and each division was marked with a suitable device, and text from Scripture. 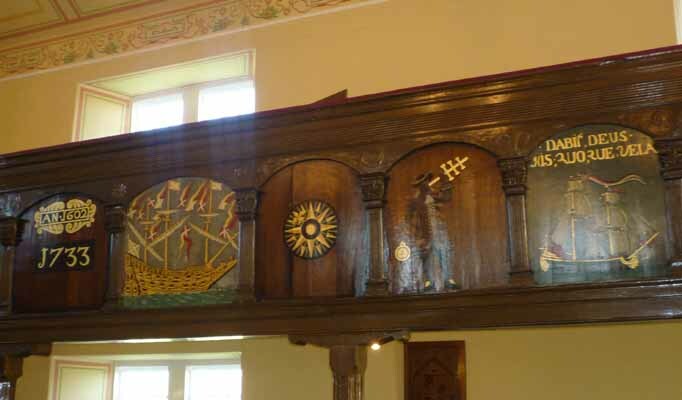 On the bakers' portion a sheaf of wheat was painted; a balance and weights on the grocers', and on the weavers', which was opposite to our pew, there was a shuttle, and below it the motto, "My days are swifter than a weaver's shuttle, and are spent without hop job." The artist was evidently no clerk. 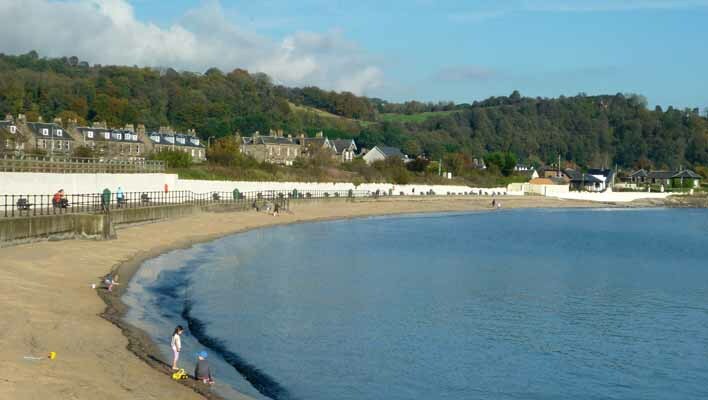 Burntisland was constituted as a Royal Burgh by James VI. The government of it is vested in 21 persons, of whom 14 are termed Guild-counsellors, consisting of merchants, tradesmen, skippers, seamen and land labourers; of whom 3 are chosen yearly at Michaelmas, by the old and new council, to be baillies; the other 7 are trades-counsellors, being one of each trade. There is also a provost chosen yearly at Michaelmas. 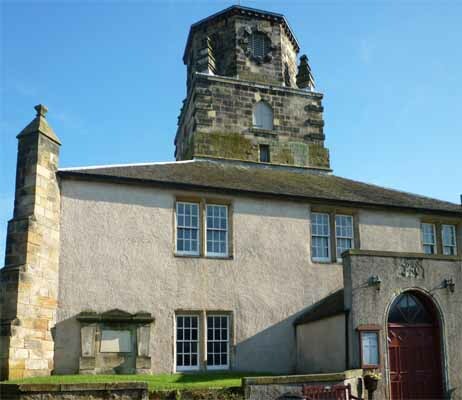 The Parish Church was built between 1592 and 1594 so it was already 200 years old when Mary attended services there. My first surprise was that the church is square with people sitting on all four sides. My second surprise was that it looked surprisingly new for a 16th century church. 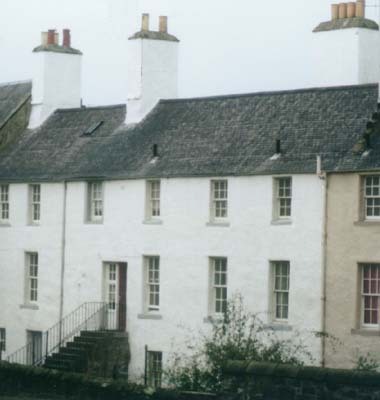 This is the result of restoration in the 1990s. Four large stone pillars support the roof and central bell tower. 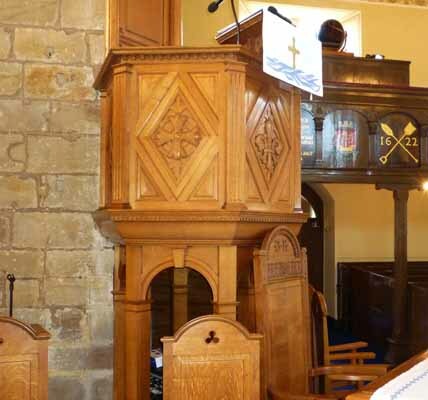 The pulpit occupies a central position making it the focus of the interior. 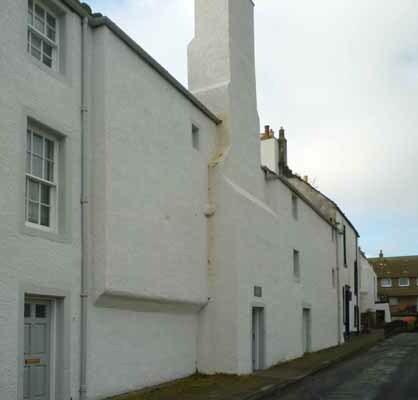 At Burntisland the sacrament was administered in summer because people came in crowds from the neighbouring parishes to attend the preachings. The service was long and fatiguing. ... Thursday was a day of preparation. The morning service began by a psalm sung by the congregation, then a prayer was said by the minister, followed by a lecture on some chapter of the Bible, generally lasting an hour, after that another psalm was sung, followed by a prayer, a sermon which seldom lasted less than an hour, and the whole ended with a psalm, a short prayer and a benediction. Every one then went home to dinner and returned afterwards for afternoon service, which lasted more than an hour and a half. On Monday morning there was the same long service as on the Thursday. It was too much for me; I always came home with a headache, and took a dislike to sermons. Our minister was a rigid Calvinist. His sermons were gloomy, and so long that he occasionally would startle the congregation by calling out to some culprit, "Sit up there, how daur ye sleep i' the kirk." I left the Parish Church in glorious sunshine having enjoyed my chat with Judith Mclay which had been filmed for the STV programme. Among other things, I had been asked what I considered the most remarkable thing about Mary Somerville. I replied that I thought that the fact that, starting out with nothing more than basic arithmetic, she was able to teach herself mathematics to such a high level that she could read the latest mathematical papers and books of her time, was incredible. She made a major contribution, recognised by her contemporaries but, with no theorems named after her and no major scientific discoveries, she slipped out of the history of science. 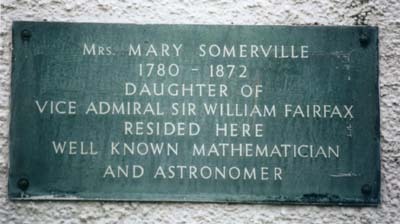 This, surely is unfair, not only for Mary Somerville, but also for many others who were vital for the development of mathematics and more generally of science but who have been forgotten. I am delighted that Mary Somerville and others like her are again beginning to get the recognition they deserve.